In lieu of the exciting results of the Exotic Aquatic Species Watch completed for the Cooperative Lake Monitoring Program in 2018, it is imperative to keep Gratiot Lake free of aquatic invasive species. The watch found no aquatic invasive plant species in Gratiot Lake! The best way to take on aquatic invasive species is to prevent them from colonizing in the first place. The Michigan Department of Natural Resources (MiDNR) recently amended the Natural Resources and Environmental Protection Act (Act 451 of 1994) Part 413 with changes for boaters and anglers that take effect March 21, 2019. The changes are intended to better protect waterways from the introduction and spread of aquatic invasive species. A person shall not release baitfish in any waters of this state. A person who collects fish shall not sue the fish as bait or cut bait except in the inland lake, stream, or Great Lake where the fish was caught, or in a connecting waterway to the body of water if the fish could freely move between the original location of capture the location of release. A person, who catches fish other than baitfish in a lake, stream, Great Lake, or connecting waterway shall only release the fish in the lake, stream, or Great Lake where the fish was caught, or in a connecting waterway of the body of water where the fish was caught if the fish could freely move between the original location of capture and the location of release. The 2018 Cooperative Lakes Monitoring Program (CLMP) report was issued and can be reviewed by clicking the button at the bottom of this post. The results of the report cover the transparency, Phosphorus content, and Trophic Status. This year’s program also included an Exotic Aquatic Plant Watch. Transparency is measured using a Secchi disk, a very simple but effective method to determine water clarity. Phosphorus concentration is determined by taking water samples and sending them to a lab for processing. Phosphorus is one of the critical nutrients for algae growth and is important to monitor. The Trophic Status Index (TSI) is a single figure used to assess the nutrient enrichment of a lake. The average Secchi depth is 16.7, which is the same as previous years. The summer phosphorus sample is 6 parts per billion, which is lower than previous years. The TSI is also lower than previous years at 33, which is influenced by the Secchi depth and the phosphorus content. The departure in phosphorus and TSI from previous years does not reveal any trends. It is normal for values to fluctuate from year to year. The purpose of the CLMP is to monitor lakes to prompt action when a clear trend in either direction appears. The next step would be to identify the mechanism causing the trend and come up with a solution. The Exotic Aquatic Plant Watch surveyed multiple locations around the lake to identify and document the extent of invasive aquatic species. As of August 24th 2018, Gratiot Lake does not contain any of the invasive aquatic plant species on the watch list. For a complete list please review the report below. Gratiot Lake Conservancy (GLC), in conjunction with some lake locals, collects data points annually to contribute to the Cooperative Lakes Monitoring Program (MiCorps). GLC has been providing data since 1999 to the program and is excited to continue to in the future. MiCorps is a network of volunteer water quality monitoring programs in Michigan. It was created through Michigan Executive Order #2003-15 to assist the Department of Environmental Quality (DEQ) in collecting and sharing water quality data for use in water resources management and protection programs. To learn more about them click here: About MiCorps . The 2017 report indicates Gratiot Lake is a 36 on the Trophic Scale Index, a metric used to evaluate the productivity, quality, and condition of a lake. The 36 places Gratiot Lake between an Oligatrophic Lake (think a barren, not very productive lake) and a Mesotrphic lake (medium amount of aquatic life and relatively productive). Given the size of Gratiot Lake, this ranking makes sense and is a good indicator of a healthy lake. It is important to continue these measurements in order to monitor the condition and quality of the lake. If Gratiot Lake starts moving to a higher or lower number (scale is 0-100), it could indicate a potential problem or threat to the lake’s ecosystem and food web. The GLC Board is pleased to announce that Ian Lizzadro-McPherson is moving into the role of Program Director of GLC. Ian has deep roots in the U.P. His great grandparents immigrated to find a better life in the Keweenaw in the early 1900’s. While Ian grew up in Illinois, Arizona, New Mexico, and Wisconsin, he spent most childhood summers at Gratiot Lake where he forged a deep connection to Gratiot Lake and GLC. Ian recently relocated to the area. Ian has a BA in Biology and Chemistry with a focus in limnology from Lawrence University. He also has a solid resume in the environmental field. He is enthusiastic about the importance of conservation and good environmental stewardship and is a strong advocate for conservation and sustainability. Ian hopes to spark that same passion in his own children and future generations. He looks forward to his role in GLC. Two pontoon sessions were needed to accomodate the number of participants for GLC board member and geologist Daniel Lizzadro-McPherson’s geo-tour at Gratiot Lake. From the pontoon boat and at the GLC Preserve participants viewed the amazing topography of Gratiot Lake, a 10,000-year-old glacially formed plunge pool carved out of 960-million-year-old Jacobsville sandstone. The lake’s mountain-backed northeastern shoreline marks an important geologic boundary, the Keweenaw Fault. One-billion-year-old lava flows (known as the Portage Lake Volcanics) sitting high above the Gratiot Lake have been thrust up and over the younger Jacobsville sandstone. The Keweenaw Fault is inferred from the sharp change in topography and bedrock. From the boat, Daniel was able point out the evidence of powerful forces that formed what on that summer day seemed a placid landscape. The group also visited the Gratiot Lake Conservancy land to identify shoreline pebbles and boulders and to picnic at the Noblet Field Station. Daniel is in the process of mapping this specific segment of the fault as part of his Master’s thesis at Michigan Tech. He has done work on Keweenaw GeoHeritage, fieldwork on the Keweenaw fault to enhance the USGS EdMAP, and is a GIS analyst at Michigan Tech’s Great Lakes Research Center. by Bill Rose and Ericka Vye with Valerie Martin. This handbook is a comprehensive overview of underlying geologic features and their influence on human life and the history of the region. It has lots of photos and maps that clearly illustrate information presented. The text is concise and understandable so a geology degree is not required to understand it. Handy links to further information on the geoheritage website are with each topic and location highlighted. This book is available at some local stores, at the Keweenaw National Historical Park Visitor Center in Calumet, or from the Isle Royale & Keweenaw Parks Association at https://irkpa.org/. 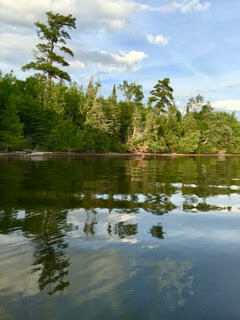 For about 18 years GLC has participated in Michigan Cooperative Lakes Monitoring Program (CLMP). Since 2006 Dorothy Jamison has been taking readings of lake transparency on average 14 times a year. Every one to two years a water sample from the lake is sent to the state lab to detect the amount of phosphorus present. Overall at Gratiot no major changes have been noted in this monitoring data over the years. In 2005 and 2006 botanist Janet Marr undertook a comprehensive survey of aquatic vegetation at the lake. The survey revealed that Gratiot Lake was home to good array of beneficial native aquatic plants. As a baseline that survey provides data for comparison in the future. Native aquatic plants provide food and habitat for a healthy community of animals in the lake, including a variety of fish, so the richness and variety of plant species found was a good health indicator for the lake. Janet even discovered one plant that is endangered in Michigan: Subularia aquatica, water awlwort. She didn’t find any aquatic exotic plant species, but recommended that the lake be monitored from time-to-time for any invasive plants before they become problematic. In July, limnologist Erick Elgin, a water resource educator from Michigan State University Extension Service, came to Keweenaw County to lead an Exotic Aquatic Plant Watch (EAPW) training at Gratiot Lake. GLC recently joined this monitoring effort through the Cooperative Lakes Monitoring Program. CLMP provides this hands-on Exotic Aquatic Plant Watch training so that those interested in lake monitoring to protect their lake can learn how to do just that. This program targets five plant species that pose the biggest threat to Michigan waters: Eurasian watermilfoil, curly-leaf pondweed, hydrilla, European frog-bit, and starry stonewort. The night before the training, Erick stopped by the GLC Members Meeting held in Eagle Harbor to give an overview of this monitoring program. EAPW is a yearly check-up for the potential entry into inland lakes of invasive aquatic plant species. Of this list, Eurasian watermilfoil is the most immediate threat to Keweenaw lakes. No invasive species were noted during the training or in sampling done afterwards. After the EAPW training, Erick presented a lake issues Q&A program in Eagle Harbor. Most questions were about shoreline erosion, lake levels, dams, and floods, especially with regards to Lake Superior shoreline. Although no easy solutions for homeowners were presented, Erick provided the links below. Pictured above are Erick Elgin (at right) and Keweenaw Invasive Species Management Area (KISMA) Coordinator Sigrid Resh and members of the KISMA weed crew sampling aquatic vegetation with a “weed rake” at Gratiot Lake during the EAPW training. Sample for benthic flora species using the double headed rake tossing sampling method, aka the ‘weed rake"'.